Bedlington Barrington Arms are through to the semi-finals of the ES Johnson Challenge Cup courtesy of a 3-0 win over Stobswood. The game was level until the 65th minute due to a lack of quality in the final third from both sides. It was The Barrington though that had the better chances with striker David Scott hitting the post when one-on-one with goalkeeper Karl Dryden, Scott also had a close range effort that trickled agonisingly past the post. The deadlock was eventually broken by substitute Stephen Young; Dylan Williamson put in an excellent cross from the right hand side and Young headed the ball powerfully into the bottom left hand corner of the goal. The Monkey doubled their lead after Ryan Stafford won the ball in midfield before finding Williamson who played in Young with a neat through ball, Young then cleverly dummied Dryden before rolling the ball into the bottom right corner. The third goal came after Craig Stafford made a surging run down the right wing before pulling the ball back to Williamson for a tap-in. 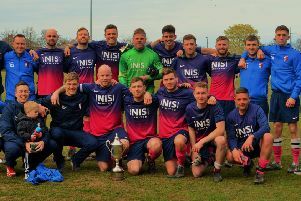 In the two other quarter finals that were played on Sunday, both The Wharton Arms and HMP Northumberland progressed to the semis with both teams scoring seven times. The Wharton Arms put seven past Bedlington FC with the scorers as follows: Joe Moscrop(3) Chris Glass(2) Andy Carr and Liam Candlish. HMP Northumberland recorded a 7-1 win over Amble Blue Bell thanks to braces from Scott Hine and Scott Willis and single goals from Stevey Burns and Andy Naylor.